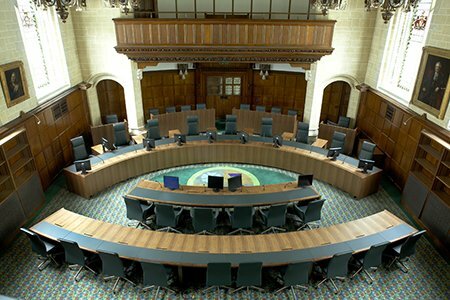 The Supreme Court of the UK is the highest court of the land, it hears the UK’s most important cases and has alongside its predecessor, The House of Lords, played a significant role in the development of law for centuries. Here you can literally watch law in action, sit in on a case and see some of the world’s top legal minds discussing the most complex legal issues. It is easy to get to, free, and well worth a visit for lawyers and non-lawyers alike. To help you get the most out of your visit here are the top things to see and do there in my opinion. Court room one is the largest court room and where some of the most famous cases have been decided. For example, the so called ‘Brexit’ case, where the claimant Gina Miller challenged the UK government’s power to trigger Article 50 in order to withdraw from the European Union without Parliament’s approval. 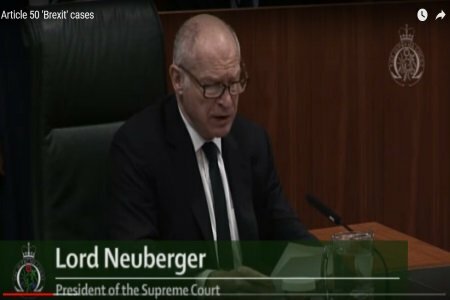 At the Supreme Court, the court decided in favour of Miller and the government lost their appeal, it was therefore necessary for Parliament to pass an Act of Parliament to allow the government to invoke Article 50. 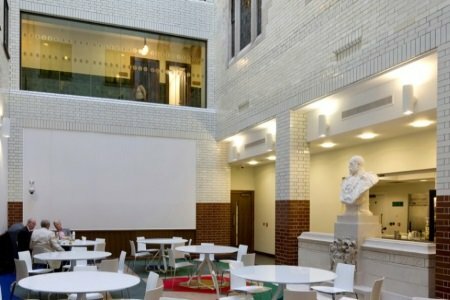 The court room combines modern and old touches, for example custom-made benches, stained-glass windows and most notably the pop-art carpet – designed by the same man who designed the front cover of the Beatles Sergeant Pepper’s Lonely Hearts Club Band Album (Sir Peter Blake). People either love it or hate it. What about you? 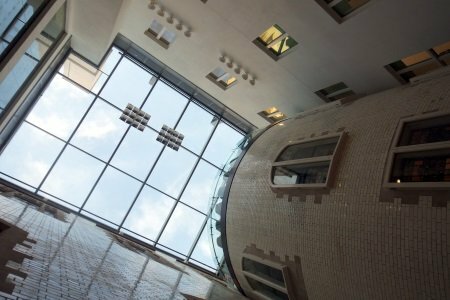 Court room two is the most modern of the court rooms, here you won’t find any wooden panelling, instead it has clean white walls, high ceilings, big windows and a lot of glass – reflecting the importance of transparency in the judicial process. You can’t fail to notice the large, modern, glass emblem of the Supreme Court above the judges’ bench. 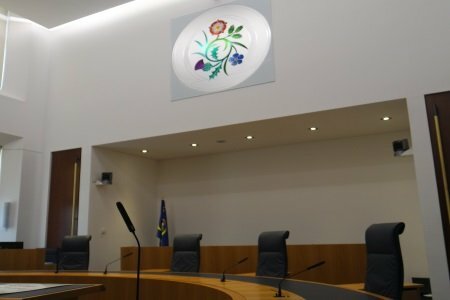 The emblem was designed by Yvonne Holton and it uses traditional symbolism from the four nations of the UK and it’s three jurisdictions. Do you know what these symbols are? The English rose, the Welsh leek, the Scottish thistle and the Northern Irish flax. 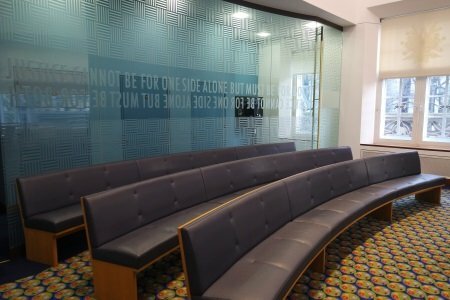 If a case is in progress, visitors can either sit inside the court room in the public gallery, or behind a large glass screen at the back, with the words “Justice cannot be for one side alone but must be for both” etched into it. Do you prefer this modern court room or the older style? Court room three is where the Judicial Committee of the Privy Council sits. This is formed of the same justices as the Supreme Court and it hears appeals from 23 commonwealth countries and four independent republics. You will notice a number of small flags on the table which represent commonwealth countries and secondly, another jazzy carpet! 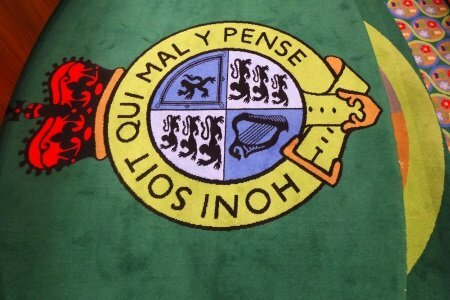 The carpet has a large symbol in the middle, consisting of a belt surrounding a circle with the words “Honi soit qui mal y pense” with a crown above. The legend goes that the King of England at the time – Edward II was dancing at a ball in Calais with a woman, apparently Joan of Kent, who was his cousin and daughter-in-law or possibly his mistress. Her garter slipped off and as people began to laugh, the king picked it up, tied it around his own leg and said the phrase “Honi soit qui mal y pense“. This roughly translates as “shame on him who thinks ill of it” or “shame on him who thinks evil“. We could think that it’s telling us to think and be good, or to not judge people too quickly. The phrase became the motto of the ‘Order of the Garter’, an ancient association which was set up by the King (a little bit like the ‘Knights of the Round Table’) and the royal coat of arms of the United Kingdom, therefore, you will see this motto in many places around the UK, as well as on the British passport. Can spot it anywhere else in the Supreme Court? Imagine your hands cuffed behind your back, a police officer behind you escorting you to your cell as you walk down the steps to the lower-ground floor of the Supreme Court. Why? In the past, this area used to be full of prisoner’s cells in the former Crown Court here. 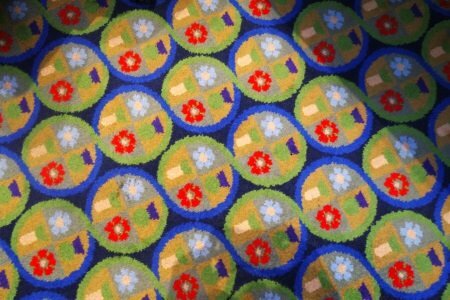 Now, it has a much brighter feeling (can you spot the jazzy carpet again!) and it houses a permanent and free exhibition. 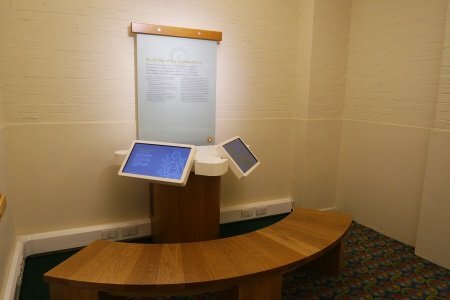 Here you can find lots of fascinating information about the Supreme Court and the Judicial Committee of the Privy Council’s history, the judges, the role these courts play, as well as examples of court dress on display and some interactive touch screens (good for kids) to get further information. 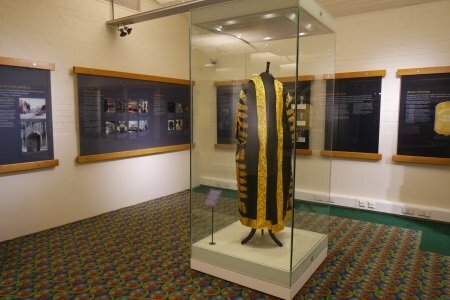 There are also temporary exhibitions for example from 5th June to 14th December 2018 there is the ‘100 Years On: An art exhibition at the UK Supreme Court’ which showcases artwork of female prisoners. Do you prefer ebooks or the real deal? Despite many modernisations throughout this court, one thing which remains unchanged is the fact that justices love books. The library (only possible to visit on a tour) is set on three floors and, as you might expect, houses a collection of law books for the exclusive use of the judges and their assistants. Here, you can find a moment of peace and engage your other senses; listen to the silence and smell that wonderful smell of books – what does it remind you of? Maybe your days studying, the time you suddenly understood an idea, the moment you read a piece of wisdom which has stayed with you for life. 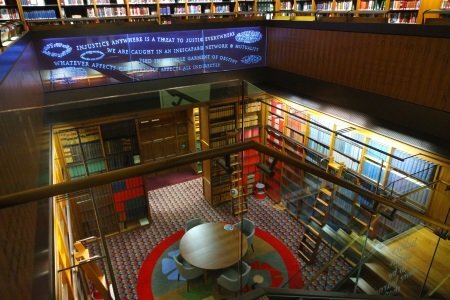 Alongside traditional design features such as the dark wooden shelves and red leather reading desks you will find a modern touch – glass panelling with quotes chosen by the justices. One of my favourites is “Injustice anywhere is a threat to justice everywhere” – Martin Luther King. Imagine we are in the middle ages, you’ve been accused of a felony, a capital crime, (one carrying a death sentence) such as murder and if you’re tried and found guilty, you will probably be sentenced to death. 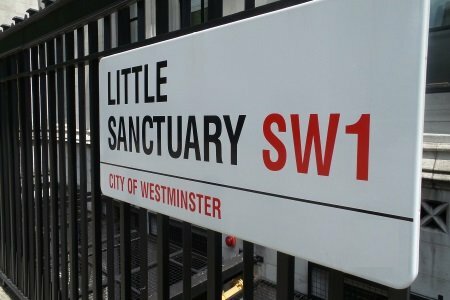 Luckily for you, the “right to sanctuary” existed at this time and so whether you were actually a criminal or simply wrongfully accused, you could seek refuge in sanctuary – normally a church, churchyard and sometimes a wider area. If you confessed your sins, then you would get forty days to renounce all your possessions and leave the country, promising to never return. Better than a death sentence! 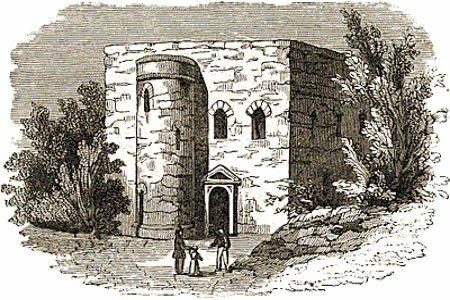 For hundreds of years, from the time of Edward the Confessor (1042-1066) the exact spot where the Supreme Court stands today, was the location of Westminster Abbey’s Sanctuary Tower – a place of sanctuary for all kinds of criminals. In fact, Westminster had a number of sanctuaries and gradually it became a place renowned for its vagabonds, thieves and criminals. Eventually the sanctuary laws were abolished and crime began to reduce. If you pay attention to the street name outside the Supreme Court, you will notice that is called “Little Sanctuary” – a nod to the past. 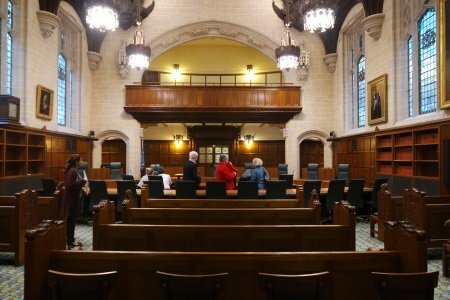 The café at the supreme court is a hidden gem, it really is a sanctuary to get escape the crowds in Parliament square. Here you can take a moment to freshen up on a busy day of site seeing, take a break in between court cases or do some ‘people watching’ as you observe some UK legal professionals in their natural environment. Even though the café is underground, the space has been beautifully designed by GHK Architects and is bathed in light due to the well-designed light well in the ceiling. Here you can find a small but ample range of drinks and snacks. Why not have a traditional English breakfast tea – the Queen’s favourite! 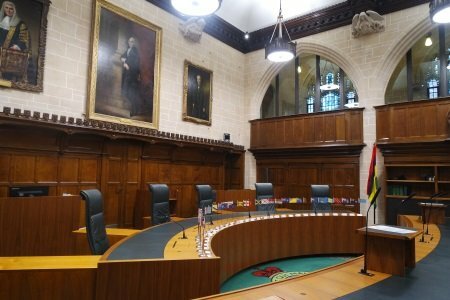 As a member of the public you can visit The Supreme Court anytime from 9.30am-4.30pm Monday to Friday for free, walk around, sit in on cases and view the exhibition. 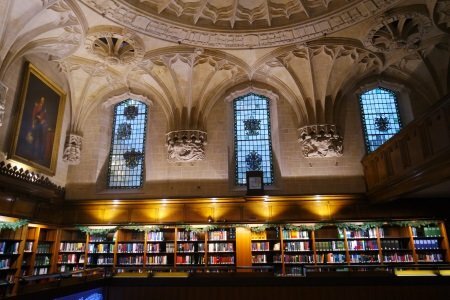 However, I recommend taking a tour, this is what I did when I visited – it was very informative, you get to visit the library which is otherwise closed to the public, and well worth the £7 (£5 concessions)! You can hear about my experience in podcast episode 49. Tours last for approximately 1 hour and run on Fridays at 11:00, 14:00 and 15:00. 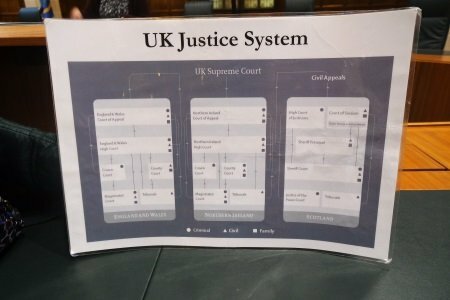 They are led by an experienced member of staff who gives lots of information about the court and my guide had printed resources to show us the structure of the UK justice system and photos of the justices in action. If you would like to book a guided tour go here. 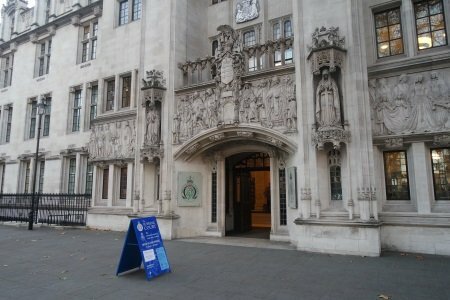 Outside of the Supreme Court it’s worth looking firstly at the detailed facade of the building by Henry Fehr depicting King John handing the Magna Carter (an important document in UK history) to the barons at Runnymede, and secondly the poem intricately inscribed onto the semi-circular benches opposite the entrance. 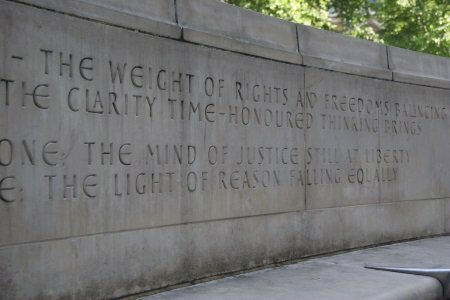 This poem was written by Andrew Motion, Poet Laureate between 1999 – 2009, to mark the creation of the Supreme Court. Try reading it, don’t worry if you don’t understand it fully, poetry is always quite difficult to understand in another language. It will probably also be a challenge for your pronunciation and you might even learn some new words. The light of reason falling equally. You can also watch the cases live streaming in the exhibition centre and even from your own home. 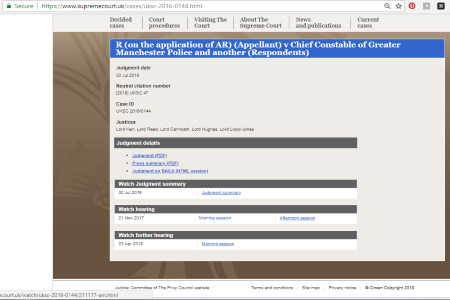 All the cases conducted at the Supreme Court are recorded and available online via the Supreme Court website just choose a case, click on it and scroll down to where it says “watch”. You can also watch some cases on their YouTube channel.